Click on picture to zoom. The culinary water system supplies water to all residents in Ivins except for those served by the private KWU water system which covers most of the Kayenta Area. Gunlock Wells: located near the Gunlock Reservoir, these wells are owned and operated by the City of St George. Ivins City purchases this water from the City of St George. Snow Canyon Well Project: Ivins City is a joint owner of wells Snow Canyon with St. George and Santa Clara. The project facilities are operated by City of St. George through agreement. Quail Creek Reservoir Water Treatment Plant: A regional pipeline delivers water to Ivins City from the water treatment plant located near Quail Creek Reservoir and wells near Sand Hollow Reservoir. Ivins City purchases this water from the Washington County Water Conservancy District. 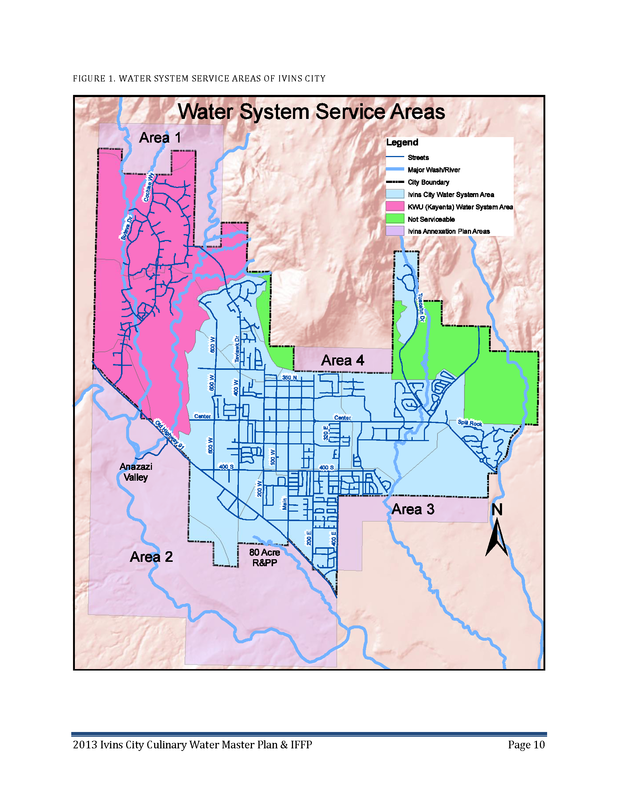 Ivins City has entered an agreement with the Washington County Water Conservancy District for all future water needs to be delivered from the District. Our goal is to provide a safe and dependable supply of drinking water to our residents. We test our water to make sure that it meets all safe drinking water standards. Each year we submit a report to our residents with the results of the testing completed by Ivins City and our water source suppliers. We live in a desert and water is precious. Ivins City encourages water conservation to its utmost extent. If you are unfamiliar with what you can do to contribute towards our water conservation goals. Please click here.